a typical and expected part of many athlete’s lives. 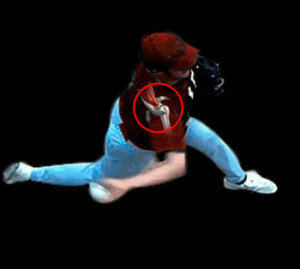 Those that spend most of their time throwing a ball are the most susceptible to shoulder injury. By the nature of their sports, baseball and softball pitchers, tennis players, javelin, and handball players put a great deal of stress on their shoulders. Their role in the game is to rapidly accelerate and decelerate their throwing arm while pushing an object from their hands. This causes the shoulder to possibly become overextended, overused, and vulnerable to tears and injuries. The shoulder is one of the most mobile joints on the body. There are four joints in the shoulder which, if injured, can cause a number of problems and pain. It is often difficult to discern which part of the shoulder is affected by injury, as certain types of pain can be caused by different causes. For example, weakness in the shoulder and aching could be due to a labral tear, which is a tear in the tissue around the arm socket, or it could be due to a rotator cuff injury, which are the muscles and tendons around the shoulder joint itself. Both are similarly painful, but completely different injuries. 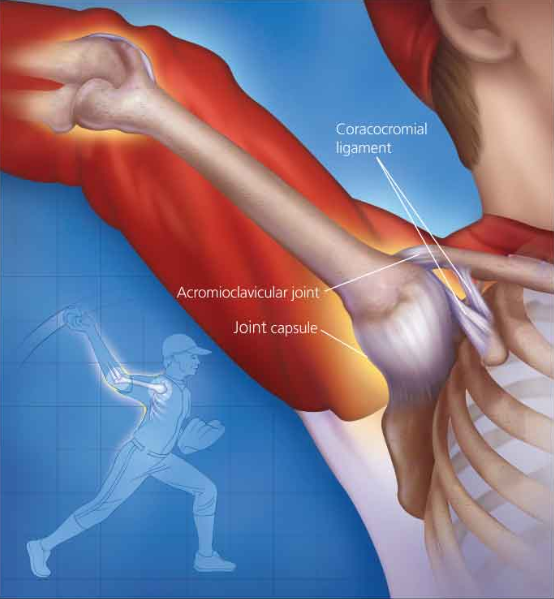 Shoulder injuries can happen to pitchers and players of any age. It is common for a young pitcher to have an injury to the growth plate located in the shoulder due to overuse and often untrained throwing styles. Those on traveling teams, who have more games than in a regular season will often find themselves sporting sore and overextended shoulders. For mild shoulder injuries, over the counter treatment should suffice. Ice, along with ibuprofen and NSAIDs (nonsteroidal anti-inflammatory drugs) will help to keep the swelling of the injury down, along with decreasing pain. Rehabilitation and physical therapy can be helpful to get the shoulder back in full use again. Rest will help, too, but there is a fine line of when rest becomes too much and the shoulder can lose its mobility and need to be retrained. This can cause problems when an overeager adolescent wants to get back on the field quickly and pushes himself too hard. Sometimes shoulder injuries to too extreme for ice and Motrin and surgery is needed for repair. Arthroscopy is a common surgical procedure for shoulder injuries. It is minimally invasive and allows the orthopedist to view the problems through an arthroscopic camera, and fix the problems at the same time. Arthroscopic surgery takes less time to heal due to the small incisions that are made, and a large percentage of players are able to return to the field afterwards. One way pitchers ages 7-18 to decrease the potential for shoulder injury is to strictly adhere to pitch limits set by Little League Baseball, which takes into consideration the age of the player and the number of pitches per day that is deemed safe to throw. Those ages 7-8 are allowed 50 pitches per day, while 17-18 year olds are allowed 105 per day. If you or your child suffer from shoulder pain, contact our sports medicine specialists at Orthopedic Surgery San Diego to undergo an evaluation. Our specialists provide the best orthopedic and medical care available.